Anon. sale, Christie's London, 2 December 1993, Lot 8. G. Galansino, Jean Fautrier: A Chronology of his Early Paintings (1921-1942), University of Chicago 1973, pp. 91-92, no. 119 (illustrated fig. 119). To be included in the forthcoming Jean Fautrier catalogue raisonné being prepared by Marie-José Lefort, Galerie Jeanne Castel, Paris. This large luminescent reclining figure is one of the most important examples from a series of oil paintings that Fautrier painted in the late 1920s known as Les Nus Roses (Red Nudes). Owing something to primitive cave art, ancient mother figures and even Roman portrait painting, Fautrier's Nus Roses mark a significant development from his earlier paintings of black and grey nudes in the textural way in which they explore the relationship between the human figure and its environment. A constant theme in Fautrier's work, the present work presents a vibrant and fertile female figure reclining on her side almost as if she were floating. Surrounded by a cocoon-like surround of white this earthy figure is illuminated by this brilliant surround so that the carefully modelled red texture of her skin seems to radiate an energy and light all of its own. The heavy impasto of this brilliant white paste suggests the texture of an oyster shell and introduces the possibility of this female being interpreted on some level as a Venus figure. 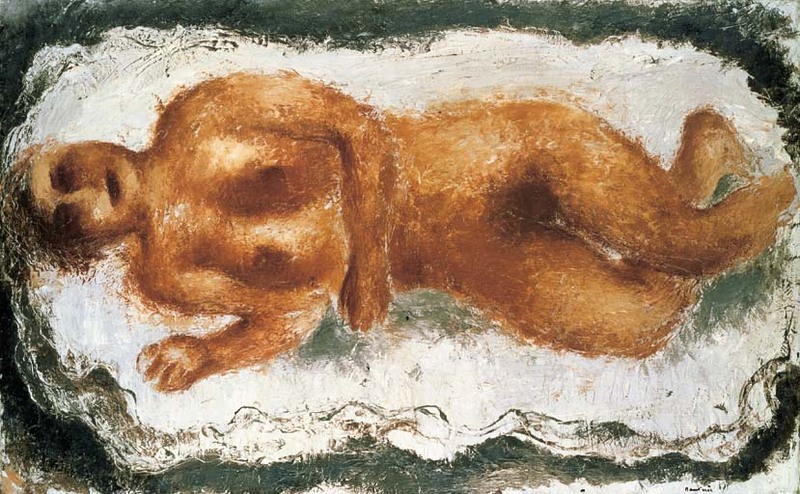 Silhouetted against a dark grey background which increases the sense of light that seems to concentrate in this warm feminine figure, the varying layers of impasto in this delicately crafted painting closely anticipate the texture of the pastes that Fautrier would devise in the 1940s and repeatedly employ in his later more abstracted work.